KILLER DECKS WILL NOT BE UNDERSOLD, BRING YOUR IN-STORE QUOTES TO US AND WE’LL BEAT THEIR PRICE EVERY TIME. 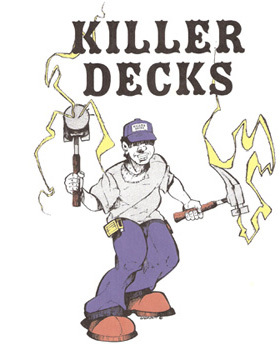 Killer Decks has been in business for 25 years. All Killer Deck products are ICC-ES rated. ICC-ES is the United States’ leader in evaluating building products for compliance with code. A nonprofit company, ICC-ES does technical evaluations of building products, components, methods, and materials. SUBCONTRACTORS: There are some trunk slammers who call themselves #1 in the decking business with out any real basis in truth. #1 in what? What makes someone #1? Certainly it wouldn’t be the amount of decks installed because to do multiple projects you need subcontractors. Certainly it wouldn’t be in a business profile because you again need subcontractors, to help manage the growing business dynamic. Also it wouldn’t be in business management because by your own words you would be incapable of managing multiple crews. So I think I am now sure of what some of the self touted #1’s must be, copiers, no business skills and no imagination, just the ability to steal designs and bally ho about subcontractors.